Ithaca 610 - Thermal, 203 dpi, 6 inches/second, 25-pin Serial interface, auto-cutter and US power supply. Color: Dark gray. Order cables separately. See accessories. Reliable, Affordable, Core-Functionality Thermal Printing. 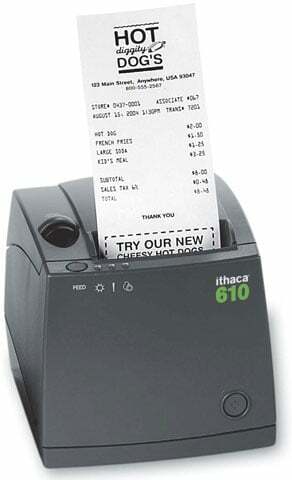 The Ithaca 610 thermal receipt printer is the latest in the growing line of Ithaca value printers. Affordable and cost-effective, the 610 features 6" per second printing at 203 dpi, a spill-resistant design, excellent print quality and a footprint size that allows it to be placed in most any place. The 610 also boasts convenient drop-in loading, a 3" print width, a partial cut auto-cutter and a variety of interface options. The Ithaca 610S-DG is also known as Transact Ithaca	ITH-610S-DG	or 610SDG	.